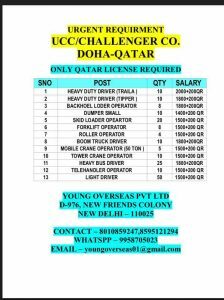 NEWLY UPDATED ucc qatar jobs huge vacancy.CLIENT INTERVIEWS WILL BE SOON. OPERATION & MAINTENANCE SERVICES DIVISION HAD VACANCY IN LARGE NOS. All above position requires min. 8-10 yrs working experience in Operation & Maintenance services.GCC exp. will be an added advantage. M/S. PRUDENTIAL TRAVELS PVT. LTD.
Hi sir ,iam Hemant kumar,my 7year exp. in electrician .work in india . Sir,I am welder.Experience 8year HLS company UAE. Now I came want your company.my mobile number 00971569387674 please call me. Myself is Azam Raza from India, Bihar. I am Azhagar . Im completed​ B.Sc Computer science. I was worked in storekeeper. I Have also 3 year Experience of India.. Now i am working in Steel fixer in UCC. I’m joined at 2 months. I need a assistant Storekeeper. asassistant​ timekeeper and office boy. 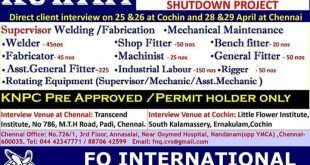 I am Althaf having 14 Exp in gulf & India in manufacturing industries and looking for job in production,planning & fabrication. Hence awaiting for positive response from your side.i will much obliged you. Hi sir good morning me govinda lamichhane from nepal I have Qatari heavy license plz send your company beetle I need job. My phone number 00977986503589i thanks you.